Patricia Sarrafian Ward was born and raised in Beirut, Lebanon, and moved to the U.S. when she was eighteen. 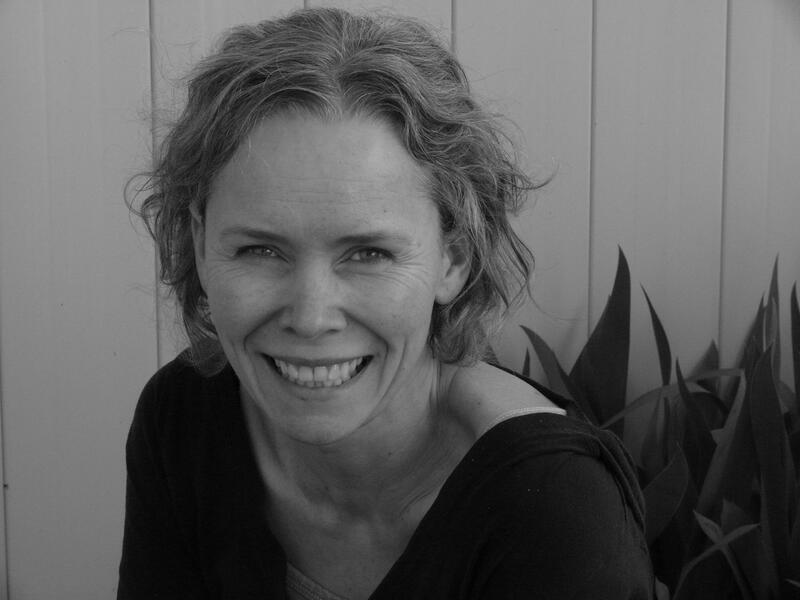 In addition to numerous journal publications and awards, her novel The Bullet Collection was published in 2003 and received the GLCA New Writers Award, the Anahid Literary Award and the Hala Maksoud Award for Outstanding Emerging Writers. 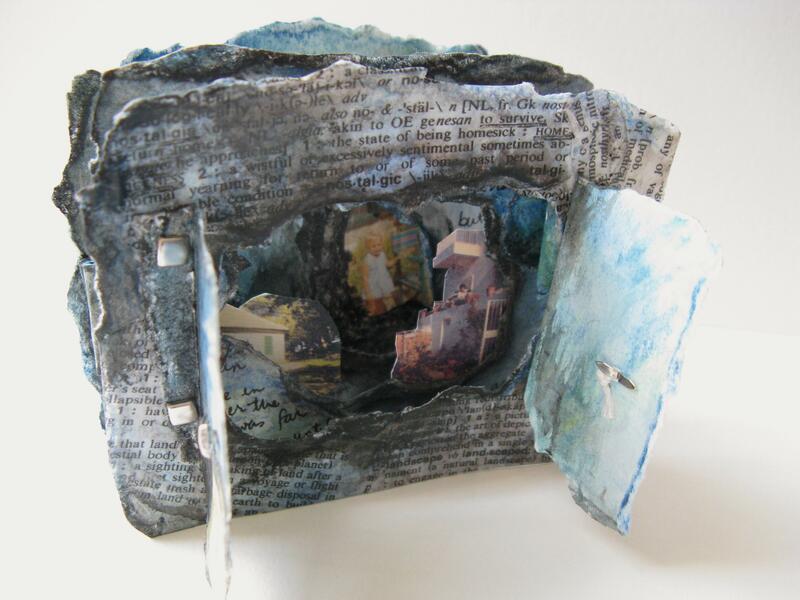 In recent years, Ward has turned to book arts, making miniature books and dioramas exploring themes of wartime experience, depression, and the creative process that have been exhibited in numerous shows in the Boston area. Her installation “Re/Vision”, composed of book-objects made from the shreds of an unfinished novel, appeared in a solo show at Gallery 263 in Cambridge, Mass., and was a Featured Artist Project at the Center for Book Arts in NYC in 2012. Ward lives outside of Boston with her husband and child. Dan Gutstein: Can you describe your writing life, amid turbulent conditions, in Beirut? Did you carry any of these writings with you when your family fled Lebanon and came to the United States? How many languages do you speak, read, write? Patricia Sarrafian Ward: My writing life began pretty much as soon as I could hold a crayon. I have tons of stories and “books” that I wrote over the course of my childhood. The earliest is from when I was about five or six, written in many colors, and tells the story of a princess accused of witchcraft. A knight comes to her defense, but can’t pass the three tests proving her innocence. They are both burned at the stake and their ashes reunite in the sky. I still remember my intense joy at their being together again, and how this joy felt suffocated by despair because, actually, things hadn’t turned out very well. Now that I think of it, that sort of “awful joy” filled up all my stories back then. As I got older I wrote most often about girls who could change into animals and bound away, or who had witchy powers, and so on. It is telling that I wrote next to nothing about war—only one novella when I was 13, but set at a remove in World War II London. In fact, when I was 17, I was writing a book in which I come out and say “The war never meant anything to me.” I’d have never admitted it then, but it seems obvious now that I used writing as a way to lift myself out of my everyday world—the war in Beirut, my sister’s depression, and the dreadful constant uncertainty that reigned over us all. So when I came to the States, I came with that same distancing of myself from those experiences. I was in a college writing workshop, my first ever, and the teacher who would become my mentor and dear second dad, Jerry Badanes, said to me, “Why do you keep writing all this stuff about love? Write about the war!” I replied (I am 100% sure I said this), “The war never meant anything to me.” He then gently and steadily disabused me of my notion. It was under his care that I found the courage to start what would eventually turn into The Bullet Collection. As for languages, I was in a French/Arabic school till I was nine, so I have a good base, but I am not fluent. Meaning, I wouldn’t pick up a French novel because it would exhaust me to try and get through it, but I can carry on a conversation when pressed. I am actually better off speaking Arabic for some reason. It stayed with me, and I have used it more in my adult life. I also know enough Italian to feel comfortable landing at Fiumicino and sallying forth. I can’t write in anything but English, though. DG: When you write “dear second dad” about Jerry Badanes, it’s obvious that he was very important to you. Can you describe how he nudged you towards writing about your experiences in the war? Did he encourage you to confront certain subject matter—or did he influence your sentence-writing? His own novel, The Final Opus of Leon Solomon, dealt with the experiences of a Holocaust survivor. Did you find inspiration in that text? My overall memory is that Jerry loved me and took great care of me. We spent many hours together talking. Jerry’s office had French doors that opened onto a small verdant area with stone benches and shade trees. When I wanted to smoke a cigarette, he’d open these doors, and then enjoy my second-hand smoke tremendously, lamenting having had to quit. I can see myself sitting in that office crying. I probably did that quite a bit. I was violently depressed, a mere few years away from almost dying in a suicide attempt. I don’t really know how he got me to write about the war. I think probably from sharing his own family memories of the Holocaust, and impressing upon me the importance of bearing witness. And because he listened, and he cared. He wasn’t really a nuts and bolts kind of teacher. He was all about writing from the heart and not fretting about commas and so forth. I do remember one extraordinary moment when he told me that I couldn’t worry about my family’s reaction to what I wrote. He said this is what it means to be a writer. That was what finally gave me permission to spill it all out. The first versions were autobiographical. Over the years, as I revised, the book transformed into a work of fiction, with the autobiography serving as the skeleton of the story. I know that his novel influenced me hugely. How specifically, I can’t say now—but in general—his love for language and lyricism, and his need to tell even the ugliest truths, and his ability to reach into the soul of things. I have wanted to re-read his book for years, but I feel a thickness in my throat when I think of doing so, much as when I want to open a book of my father’s and end up leaving it closed. I am mystified by the intensity of grief. They say time heals all, and it does, but not grief, which when you crack the door even the smallest bit, is still as bright and awful as ever. DG: It’s easy to tell that your time with Jerry meant quite a deal to you both as a writer and as a person in despair. Which other writers have influenced you? PSW: Gabriel Garcia Marquez—One Hundred Years of Solitude. Umberto Eco—Name of the Rose. James Joyce—“The Dead.” Sebastian Faulks—Birdsong. Elias Khoury—Little Mountain. And on and on. Every book, you’re at a unique moment in your life, and it touches you in that context. For example, Little Mountain stands out in my memory because when I read it, I had just discovered there were books about the Lebanese Civil War that were translated, that I could read, that illuminated my own experience—one which was terribly isolating, here in the States, to the point that for years, I actually wouldn’t even tell people where I came from because it would elicit such shock and curiosity. When I was finishing the first real draft of the novel, I was reading Tim O’Brien along with all the Lebanese writers I could find. The intensity of his voice and his willingness to lay himself bare affected me deeply. At that time I also discovered Miriam Cooke’s War’s Other Voices: Women Writers on the Lebanese Civil War. I understood that my voice belonged to a family, that I was not alone. DG: Of the many things that inspire me about your novel, one is my feeling that the book is “not on the clock”—or if that’s not accurate, then perhaps there are many different clocks ticking throughout a given station, a roomful of clocks that tell “many times” as opposed to a single hour. The effect, to me, is that the story can radiate the soaring sentences and fearless descriptions, without the insistence of “plot.” I think of The Bullet Collection as a deck of cards. How did you shape the novel? PSW: Your use of the word shape reminds me of a key moment many years ago during my journey writing this novel, when an author at a conference explained how some books do not have plots, but they do have shape. Finally, I was freed from this notion that I was supposed to carve a plot into my book! I was aware from the beginning that the narrative was non-linear and fragmented. It just came out that way, it felt natural and real, and I couldn’t impose some other, more orderly voice on the narrative (and sometimes I tried because I thought I should). This book, while fictionalized, is very much entwined with my own experience, and the “not on the clock” sensation you talk about reflects how I lived for years after leaving Lebanon. I now understand this is born of trauma, this kind of half-life of intense nostalgia and homesickness, recurring memories, relived experiences, all while frantically trying to reconcile to the present and make a go of things. In fact, when I look back on how I wrote this novel, which was in bits and pieces over many years, I realize that even that years-long process mirrors the shape which mirrors the content. (i) This novel is about the Lebanese Civil War and its effects on a family, but it’s also about sisters. As we see in this excerpt, the book is named for Alaine’s bullet collection, and Alaine, of course, collects other elements from the war—a canteen with a bullet hole in it, shrapnel, and a gas mask, never mind her discovery of a dead Syrian soldier. The narrator, Marianna, is envious of Alaine’s involvement with these pieces of ‘materiel’, but what else did the war mean to these sisters—as siblings with rivalries, and fights, and glowing moments of teamwork? PSW: Well, when you live in a war, the fact of it is crushing, all-encompassing. It infects every part of your life. You cannot step outside, or think of stepping outside, without considering the state of the war. Is the sky quiet, is there a murmur on the horizon? Are the roads weirdly empty? Where was the latest battle? When does the cease fire expire? Shall we go shopping now or wait? Is there school today? And so on. It is completely oppressive and controlling, and totally unpredictable. It’s like an abuser who is happy one day and enraged the next, and you have to react accordingly. In this way, the war is like another character in the novel that the children are both trying to have for themselves, to control. Marianna is jealous of the ‘materiel’ because it represents Alaine’s close relationship with the war. She wants the war, too. She wants to go out at night, she wants to find corpses and see blood and body parts. Her need is born of the total powerlessness of a child civilian in an unpredictable and terrifying world. She longs to be let in, to be able to do something rather than stand apart as a helpless witness, even if it means self-destruction as it does for Alaine. So the war defines them at every level individually, and also defines the mechanics of their relationship whether fighting or colluding, throughout each of their entwined depressions and eventual recoveries. (ii) DG: The family in The Bullet Collection leaves Beirut, but before it leaves, the family members also deal with near-leaving, in which suitcases are packed, left in the hallway, and then unpacked to great relief. This flight (and near-flight) is wrenching given the many emblems of home and belonging evident in this excerpt, including the family’s togetherness, Mummy’s baking, the chickens on the balcony one flight down, and the proof that Saisaban once hoofed into a living room. Can you talk about some of the most important traditions and landmarks this family had to abandon when the war finally forced them to leave Lebanon? PSW: When they finally leave Lebanon, the family breaks to pieces, and I think this would be the greatest loss of tradition, that of the close-knit family with shared meals and an open door to family and neighbors. During the war, despite the tremendous strains they were under, there was a feeling of camaraderie, of being in things together, but in the U.S., they are stranded. Away from relatives and friends, from the norms of wartime life, from all that is familiar, they drift apart and don’t know how to interact. In terms of landmarks, everything is alien—the nicely-paved streets, the wooden houses, the greenery, and rain falling in summertime. The house they live in is bizarre with its linoleum floors and creaking noises, seeing as they come from dwelling in stone and tile. All these elements of strangeness and loss are drawn from my own experience without any fictionalization. In fact, when it comes to that abandonment of home, I don’t think I fictionalized an iota. How do you create a simulacrum of such a loss? In the novel, Marianna sees the lights winking on and off in her uncle’s apartment in Ma’amaltain as the boat pulls away from shore. I can still see those lights. I can go right back to the heaving boat and the stench of oil and the grief of leaving. That light still hurts—even though it technically shouldn’t. After all, since that night in March 1987, I have gone back to Lebanon many times. I have gone into that very apartment I thought I’d never see again, and flipped the very switch that winked good-bye. Some years ago, my uncle sold the apartment, and now I will never set foot in it again. Time has moved on and delivered turns I’d never have imagined. And even after all this, the memory of that light growing fainter on the hillside still lances me. It represents everything intangible that cannot be retrieved. Home. Everything that is represented by the bread, the balcony, the chickens, singing before mealtime. Maybe everyone has that winking light and it’s called childhood—I don’t know. But I can tell you, I went back to live in Beirut after grad school, and it’s just plain true that you can’t step in the same river twice. Though who’s to say I won’t try again before I expire. “Alaine came back one day from Crystal Mountain carrying a dirty rag and a canteen with a hole in it. A gas mask hung from her shoulder and she was bent beneath its weight, the big goggle eyes swinging against her back. —I found a body, she said, and smiled. A few weeks before, we had heard that someone’s dog had been killed. They said its eyes had been gouged out. —No, stupid. Not a dog. 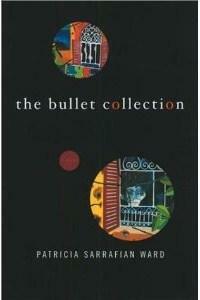 After you published The Bullet Collection, you turned some of your creative energies toward book arts. Could you describe some of these works? Have any of these projects grown out of your background in Beirut or your fiction writing? Do you have any new exhibitions on the horizon? PSW: I actually spent several more years writing before turning to book arts, and have a heap of unfinished manuscripts that have been nagging at me … in fact, at the moment I’ve set book arts aside in favor of finishing one of them. The themes of war, displacement, and nostalgia most definitely resurfaced in that medium. In fact, at a certain point I noticed that the books themselves were physical manifestations of my experience as a child, which overwhelmingly I associate with being indoors, hiding, peeking out at the turbulent, inaccessible world. So in “Nostalgia” and “War Dreams”, for example, the tiny figures of myself and my sister are within the walls, and in a weird but apropos reversal, the viewer has to peek in to absorb the full experience. 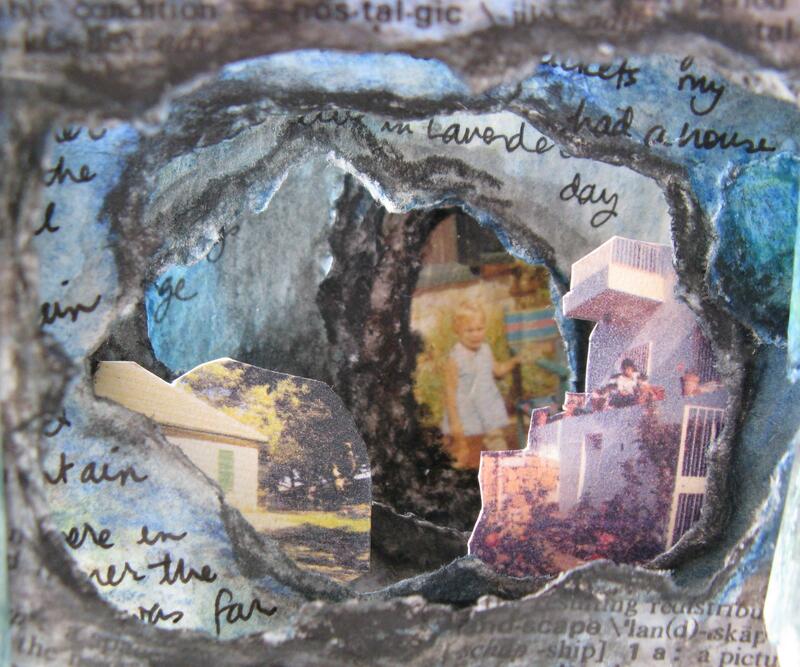 I have come to understand that the smallness and the layers in these tunnel books serve as a kind of buffer. I do not look head on at this part of my life, but with care, with not everything visible at once. In this way it is a kind of protection, the window set in a wall, the wall shielding me. And this makes sense because sometimes when I catch a news segment about some war on the other side of the world, I will literally collapse in tears, having been caught unguarded, with no buffer. Another example is “If It Were Zack.” This is a silent scene composed of images from the bombardments in Gaza. The sad truth is they could be from Syria, or Afghanistan, or Iraq, from any number of places, at any given time. I inserted myself with my son Zack, fleeing with him, trying so hard to protect him only to lose him and then find his little body. The corpse of the toddler in the last scene is from South Lebanon, during the 2006 Israeli bombardments. I wept as I made this book. How could I not? This was someone’s child. The most recent book I made is called “The Same One Place.” I think of it as the sequel to The Bullet Collection. It is a small, reversible tunnel book describing the nostalgia and pain of my lost home and vanished past … and this experience is mirrored by my present life in Maynard, Mass., with reflections on how, at last, I have made my peace with my two lives. DG: Thanks for this conversation, which has illuminated your process as a writer, your difficult experience in the Civil War (and after), and your book arts projects, among other topics. Please describe two pleasures in which you participate, whatever they may be. For example, if you prefer a certain style of beer, please do tell. PSW: Ah, all things eventually come back to stout … as it should be. I’m so looking forward to apres-ski stouts! (I don’t get into them in summer.) My favorite last year was Cadillac Mountain, with Mean Old Tom and Founder’s Breakfast tying for second. In addition to discovering sumptuous beers, my other great pleasure is swimming. There is nothing more magical for me than walking through woods and meadows and going for a swim in a pristine pond. It’s like finding myself in the life I dreamed of as a kid. I’m in disbelief, every time. The Syrian refugees now number over 6 million. With this in mind, Patricia started a fundraiser for Save the Children that comes with a 3:1 match from USAID. About the fund, Patricia writes: When I was a kid growing up in the war, I felt abandoned by the world. I even wrote a story in which Lebanon was forgotten—the characters wake up and Lebanon is no longer mentioned on the BBC, Cyprus isn’t visible anymore, and any attempt to flee ends in failure, the roads magically turning back to Beirut. Lebanon is obliterated by war, and the world doesn’t notice. I used to wonder how all those people out there in the world could just ignore what was happening. I pictured them in their pretty houses with their lawns and cars and quiet lives, oblivious and heartless. And now, I am one of those people. I live my quiet life in my nice house in my stable country, far, far away, and somewhere on the other side of the world there is a weeping kid wondering why I don’t do anything to help. I realize now that people did care, and they do care, they just feel powerless. I have suffered from the same paralysis, again and again. I don’t think writing letters to politicians or making pieces of art is enough. So I decided to take action that has concrete impact. Save the Children is there every day, on the ground, handing out food and shelter and providing hope, all around the world. This organization lets kids in crisis know that the world does care. And these kids desperately need to hear that.